Here is a stereo 3D video for a song called “Gloria (The Death of Me)” by The Raw I’s. The video was made by Andrew Murchie from Enhanced Dimensions, who kindly shared it with us as well as some details about how it was made. 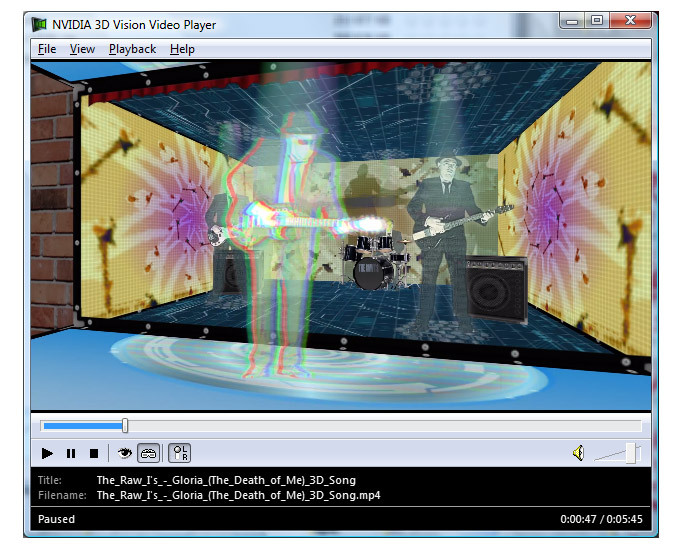 The 3D Music Video you can download is in 1080p Full HD resolution in Side by Side format, and there is also an anaglyph version available on YouTube. The concept of the video is that of a futuristic Hologram Projection Kiosk where a band performs – with the band as projected holograms, but the stage props, in this case guitar amps and drum kit, are solid objects. Andrew liked the idea of being able to actually have your own little hologram theatre and watch your favorite band performing on your desktop. The concept was in part inspired by the memory of the Sega Holographic coin-op “Time Traveller” if you remember that far back, and partly by the pepper ghost illusion that is being used so effectively at live events/theatres etc. to project “holograms” in front of a live audience. The video footage was shot using a single Sony HDR-FX 7 camera with the cast performing to the track in front of a greenscreen. The cast were then composited in a 3D environment created entirely within Adobe After Effects and the various shots and moves were generated with the stereoscopic effect controlled using a custom After Effects 3D rig. With the custom rig the scene and general camera move is created and the stereo effect can be increased or decreased allowing the rendering of versions suitable for a variety of screen sizes. The online version is really optimized for the Samsung Syncmaster 223RZ 3D Monitor – in other words optimal for around a 20-26″ screen. The rendering was a massive task though – each character has three animated tracking lights plus the every panel has multi-layered animation continuously playing – and this is all rendered using an off the shelf quad-core PC with 4GB RAM. To make one change, like modifying the guitar amp design for example, would then entail a week to re-render all the shots. All told the video has taken over six months to complete – all done in evenings and weekends. For anyone who might be interested in learning more about creating stereo 3D using After Effects Andrew’s website has a section entirely devoted to tutorials from creating basic 3D through to more complex 2D to 3D conversions here. You can also visit The Stereoscopic 3D Channel on Vimeo with videos from multiple users or The Stereoscopic 3D Video Channel on YouTube with more videos from Andrew Murchie.